Happy Tuesday! Today I’m headed to Austin for the rest of the week + weekend to celebrate Thanksgiving with my family. I’ve gotten a bunch of work done over the last two days, all so I can relax and unplug for awhile. I’m looking forward to a lazy week with family, with the exception of cooking up a storm in preparation for Thursday’s dinner! My mom, sister and I are starting a new tradition this year and doing Austin’s Turkey Trot. It’s been around ever since I can remember, but we’ve never participated before because we’ve always had Thanksgiving lunch. Hopefully this cool weather sticks around for it! 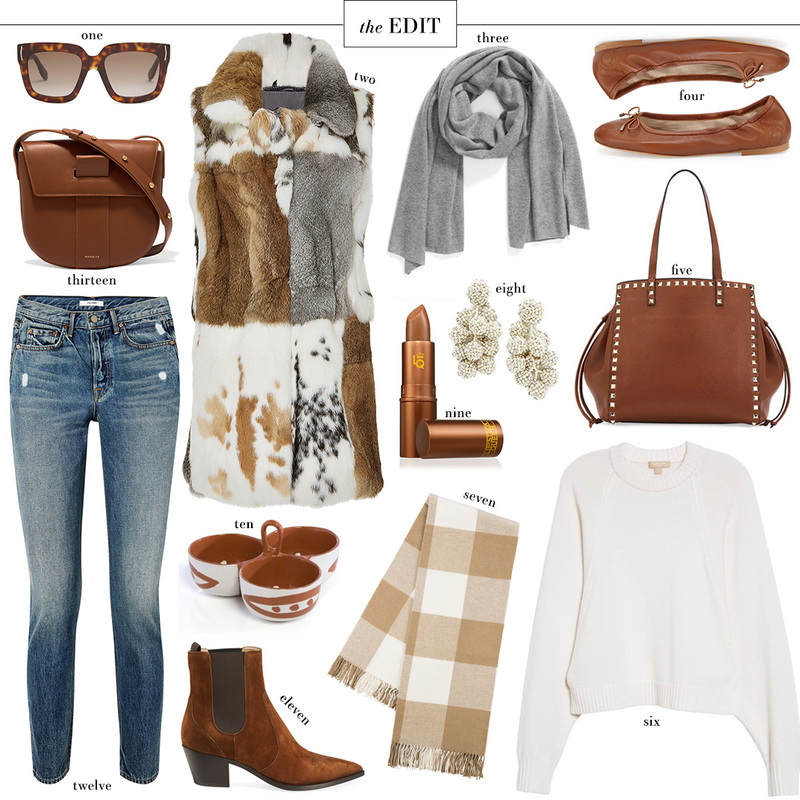 This cozy and casual EDIT is just the look I’m going for this week when I’m at home. Jeans, a sweater, comfortable boots and a warm topper will be my go-to! What are your favorite Thanksgiving traditions? I’ve been eyeing the Simon Miller bucket bag for awhile, and the fact that it’s marked down to under $250 makes it even sweeter. This sequined pencil skirt is a fun option for a holiday event! Dress it down with a sweater or up with a lace top! Does it get any more chic than a pair of classic heeled ankle boots? This black pair is sleek and refined with a pretty patent toe cap. This embellished velvet jacket is an amazing cocktail jacket to pair with leather leggings and heels, don’t you think? Fabulous! These Lanvin T-strap pumps have been on my wish list all season, but I also just discovered they come in flats… How to choose?! If you’re still on the hunt for a fun party dress to wear for your office holiday party or Christmas Eve, check out this Anna Sui number. This Roksanda top is a must-have wardrobe staple. Can’t believe it’s part of the sale! This Preen dress is another gorgeous Christmas-appropriate dress! Such a stunning shade of green. Loving the look and price of this bag by Marques Almeida. That oversized chain is everything!! I have my eye on that crossbody bag and sunglasses! Love this cozy look. I hope you have a fabulous Thanksgiving! You always have the best edit Merritt! I love your picks! Happy Thanksgiving to you and your family!